I don’t think it’s any secret that I find almost all of the programming on the Food Network to be really, really terrible. Their new shows just get dumber and dumber and less and less useful. It feels like they’ve completely sacrificed culinary sensibility and education for personality, and whoever decides what kinds of personalities make the cut has tastes diametrically opposed to my own. 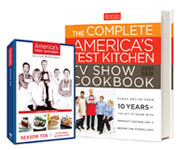 My favorite program on Create’s admittedly irregular schedule is America’s Test Kitchen, which is an extension of the magazine, Cook’s Illustrated. (Gourmet is dead, but advertising-free Cook’s Illustrated is still going strong. I’m just saying.) The television version has all of strengths of the magazine – useful information developed with rigor and standards – with the added bonus of just enough personality. There’s none of the toothy mugging that makes Food Network programming largely unwatchable; there’s just smart, likable people who are sincerely enthusiastic about food. The idea behind the magazine and the show is to develop the best possible versions of popular home recipes. And I have to say, their success rate is very, very high based on the recipes I’ve tried. (I grew up in Cincinnati and ate more chili than burgers, and their Cincinnati chili recipe is spot-on.) There are also segments comparing products like chocolate, cheeses, jarred sauces and the like, and equipment ratings where they test and compare the usefulness of various kitchen products like knives and ricers. I don’t think I’ve ever watched a show and not come away wanting to try one of the recipes or knowing more about kitchen tools and preparation techniques. There’s more good stuff in a half an hour than there is in an entire day of Food Network dribble. The master of ceremonies is Christopher Kimball, founder of Cook’s Illustrated and the resident crank. He would never be hired by the current Food Network regime because he’s caustic, not particularly telegenic, and unapologetically smart. He’s a culinary curmudgeon, not in the self-congratulatory, bad-boy way of Anthony Bourdain, but in the sense of someone who doesn’t have any patience for bad food but has the determination and resources to try and make it better. His co-hosts are all appealing to varying degrees, and they treat Kimball with the kind of wistful indulgence you reserve for a grumpy, funny uncle, which is exactly what Kimball seems to be. This entry was posted on Sunday, January 31st, 2010 at 5:52 pm and is filed under Food, TV. You can follow any responses to this entry through the RSS 2.0 feed. Both comments and pings are currently closed. I love this show. I’ve gotten some of my best recipes from there. Their quick mushroom risotto really works! And their antipasto pasta salad is the only one of those I can abide. My husband loves that one. I had no idea you were from Cincy. Me too. I didn’t think ATK could make the chili right so I never tried it. I always end up using that Cincy Chili spice packet since it’s closest in flavor, but it’s way too salty. I was stuck in the hospital the last couple days and had the Food Network on TV. I left the sound off. It helps. But then this show came on by this person named Sandra Lee, who uses crap premade ingredients to make all her dishes. I couldn’t believe it. It was like Kraft’s Test Kitchen, starring Velveeta. Where’s the love for food or cooking?